The lone red lancer, central fig. Looking west, a long way to go. View with KAYENDEE diplay cover. This diorama is still the small size, just a little wider than the Vikings diorama to allow for the three paths which I’d decided on. As for the weight, again I kept it to a minimum with a thin base board, foam core to form the terrain covered by a thin layer of plaster. I have long had the desire to do a snow diorama, a challenge I admit, as I live far from any snow and have not had much chance to know its characters. However, a bit of research and chats with those who know a bit about snow was all I needed and away I went. Why the Moscow retreat? Well for me it was the obvious choice because I’ve read quite a bit about it and seen some really dramatic paintings. 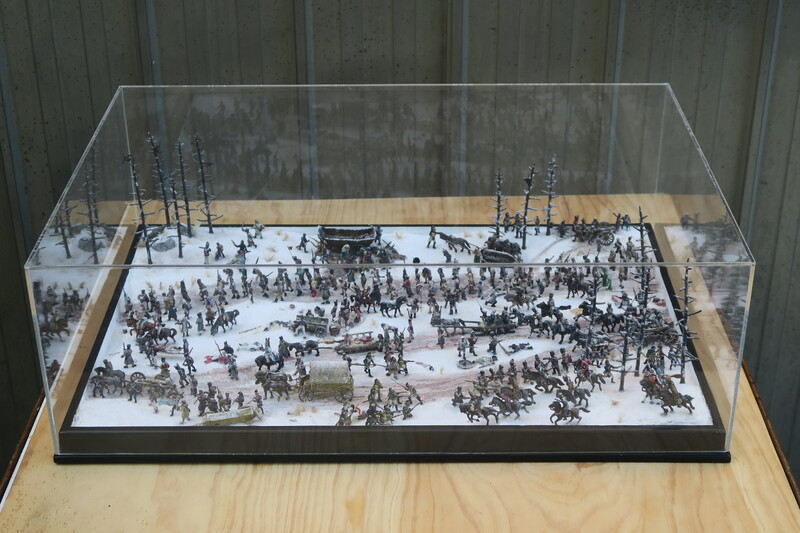 Once again I painted the figures over the winter period, about 320 soldiers and civilians plus 60 cavalry, but of that only 273 soldiers and 24 cavalry were used in the end. Water is normally my big challenge on a diorama, this time it was snow. In the end I chose Woodlands snow for the main with a little dusting of bicarbonate of soda at the end. I had a few moments early on when it did not look very real but in the end with the final dusting of bi-carb I feel I achieved what I was looking for. The pine trees are just the arburtuses from woodlands twisted really well and dusted with snow. I did try some green foliage but that did not suit my idea of cold desolation. The placement of the figures was pretty straight forward as any trek would be, and the smaller groups just came together as I went along with the Russian cavalry attack in one corner and the splendid wolves from Nikolai in the opposite one. The bottom corner is left comparatively bare as this I feel is the best angle to view the whole scene, any trees would just block the vista. This is really great! You always pack your scenes with tons of action and detail. Lots of little stories going on in there. Do you paint all of the figures yourself? Or are they pre-painted?